Nestled between two large, bright pink-flowering rhododendron shrubs, our blue rhododendron isn’t flashy, at least from a distance. Its leaves and blossoms are small, so you have to get up close to appreciate it. But what “Bob’s Blue” lacks in stature or audacity, it makes up for in reliability – it’s always the first of our three varieties to bloom each April. “Bob’s Blue” is an award-winning rhododendron variety in North America, and popular enough nowadays that you’ll find it in many garden centres, as we did when we purchased our plant. It was developed here in British Columbia by the late Dr. Bob Rhodes, a highly respected name in the rhododendron world. But for me, there’s an even more local connection to this story. Bob, a medical doctor by day, was – like his wife Jean – passionate about growing, propagating and hybridizing rhododendrons. Their garden in Maple Ridge eventually had 1000 of them. As they prepared for their full-time move to Gabriola Island, they took cuttings from about half of the plants (their favorites), grew these in small pots and carried a few to the island each time they visited their property. Over time, they created another amazing rhododendron garden here on Gabriola. I was fortunate to tour that garden once with three members of my family, when Bob was still alive. He and Jean welcomed us warmly and showed us what they had lovingly created on their steep, forested property: a winding, terraced paradise of rhododendrons of every size, shape and colour – a shady, restful and inspiring place where I could have wandered happily for days. By contrast, our own rhododendron garden is tiny at just three plants. But I love the fact that the one in the middle represents a little bit of the decades-long passion of two of my fellow islanders for these beautiful flowering shrubs. There’s just one week left for my solo show, Intimate Landscapes. 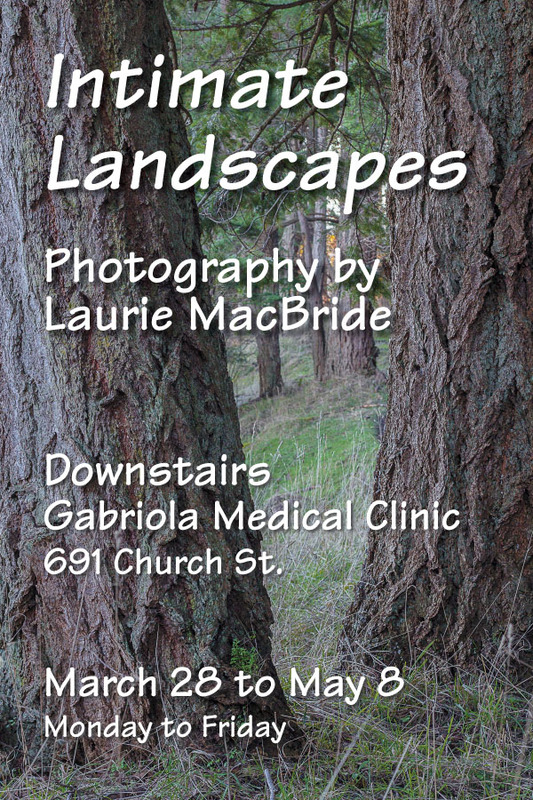 If you’re on Gabriola Island and you haven’t already seen it I hope you’ll drop by – Mon. through Fri., downstairs at the Church St. medical clinic (Lifelabs). 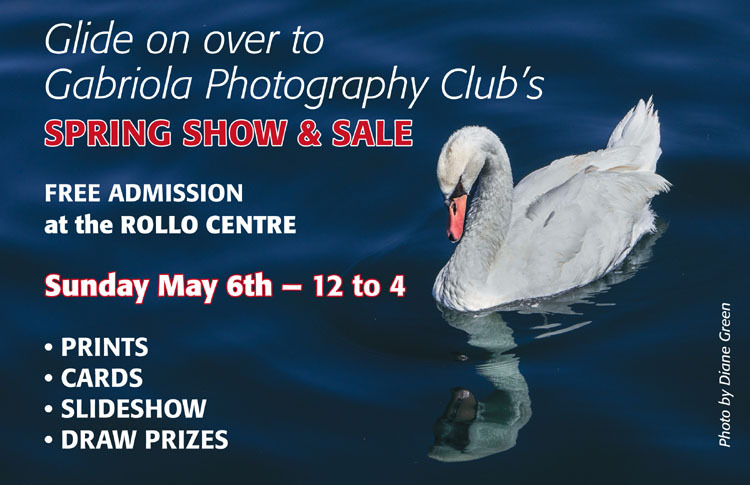 And coming up on Sunday, May 6, don’t miss the Gabriola Photography Club’s Spring Show & Sale (noon to 4 pm, Rollo Centre on North Road). See you there! 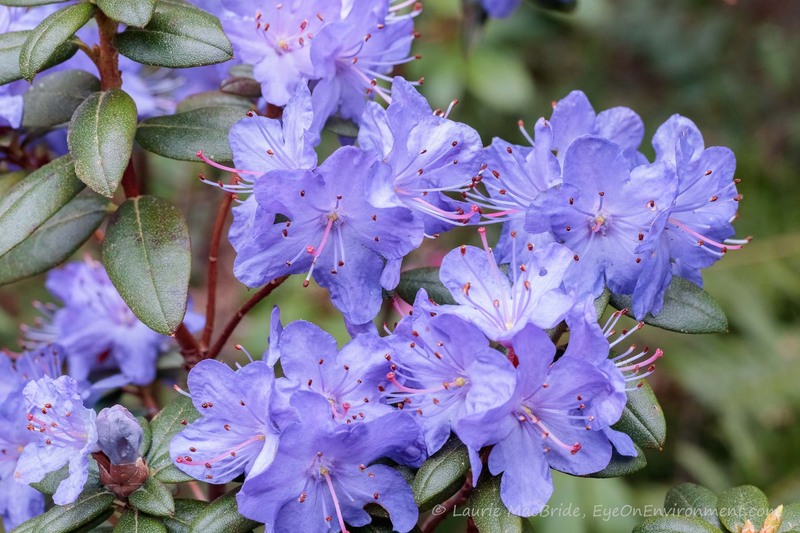 Posted by Laurie MacBride, Eye on Environment on April 30, 2018 in Garden and tagged beauty, blue, colours, flowers, Gabriola, gardening, nature, plants, rhododendrons, spring. Great story Laurie and a neat pic. We have a few variety of rhodos that look grand but I don’t know their names alas. I confess, like you, I don’t know the names of our other two rhodos, Paul – we just call them “pink rhodo” and “big rhodo”! Had I not met Bob and seen his garden, I probably wouldn’t have remembered the name of the blue one either. Thanks for the comment, Paul – and sorry it took me so long to reply…am running a bit behind!